My first digital scribing gig was through Kelvy Bird and her partnership, dPict. Kelvy saw me do digital recording at the IFVP conference, and when the MIT Age Lab asked her to provide the same sort of service at their annual member meeting, she thought I would be a great fit. For this conference, the Age Lab designed a roundtable discussion focused on how the sharing/on-demand economy will impact the lives of the aging population. They brought together leaders from both large established companies like AARP, USAA and CVS Health, among others, with start ups like Lyft, Hello Alfred, Honor, and AirBNB that promise to disrupt the business and lifestyle of the elderly and their caregivers. There were several focused discussions, each opened and facilitated by one representative from a traditional and new economy representative. I was set up on my iPad to capture the flow and content throughout the day. My set up before the session began. I recorded one journal page for each section of the agenda, and had so much great content to capture! The conversation was fascinating, and I learned so much by being a fly on the wall (or on a humongous projector screen). I was concerned that the scale of my capture would be somewhat distracting for the participants, but I received great feedback that having my notes display live was a fun way to track and enhance the conversation. I created a gallery to share all of the different pages of content below. Hover over each image to read a quick description, and click on the image itself to view the larger format on Twitter. 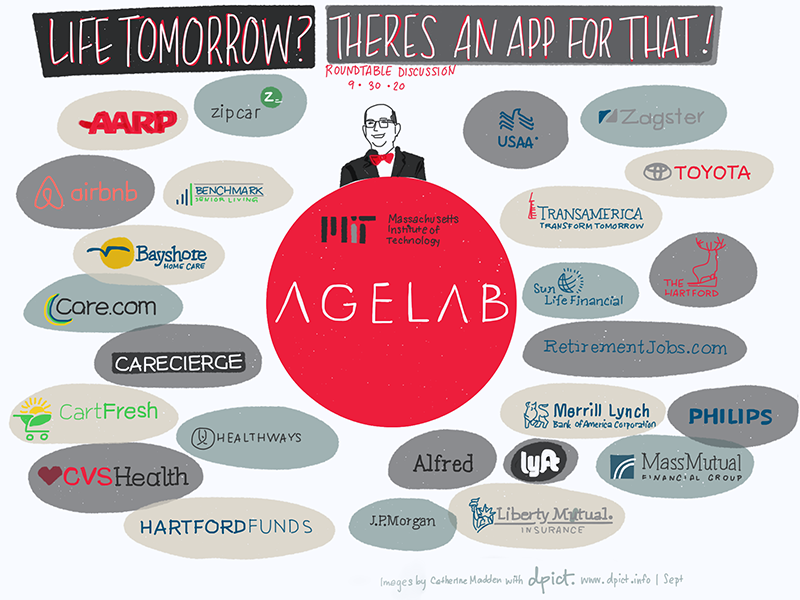 AgeLab did a great job getting representation from many different businesses that are directly or indirectly involved with the aging population. Joe Coughlin, head of the AgeLab, opened up the day with a few requests of the participants and a great video created by my friends at Motiio Media. The way that we live and plan for retirement is changing based on evolving technology and norms. It was fascinating to hear from traditional financial services companies about how this is impacting their business. What's the AARP up to? Jo Ann Jenkins, CEO of AARP, gave a quick talk during lunch where she shared the focus areas of her organization. Tom Grape from Benchmark Senior Living and Seth Sternberg of Honor shared their thoughts and experiences coming from two very different sides of caregivers of the aging population. Anita Roth of AirBNB and Debra Whitman of AARP focused their discussion on the relationship between these on-demand and sharing economy businesses and the job market for both caregivers and the elderly themselves. Joe Coughlin and others tweeted some of the noteworthy comments throughout the day, which I decided to capture visually as well. All in all, my first gig was a great success. I couldn't have asked for more interesting content, and Joe and the folks at the AgeLab were thrilled with the result.